USA (Scott C15) 1930 ZEPPELIN $2.60 BLUE Fresh, MINT never hinged, bright color, sound, fine to very fine. Cat price $975. USA (Scott C15) 1930 ZEPPELIN $2.60 BLUE Used with machine slogan cancel. Fine to very fine. Cat $600. 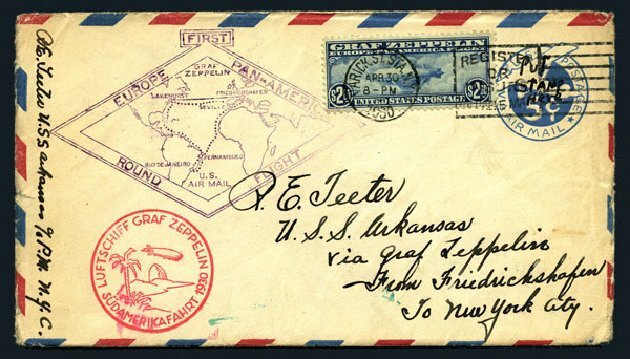 U.S.; Airpost, 1930, $2.60 Graf Zeppelin on South America Flight Cover, #C15, tied by Varick St. Sta., N.Y. Apr 28, 1930 machine cancel, flight cachets in red and violet, Lakehurst, N.J. May 31, 1930 receiving cancel in green on reverse, cover with 2 stain strips on reverse, otherwise Fine to Very Fine. Scott $625. Estimate $300-350. 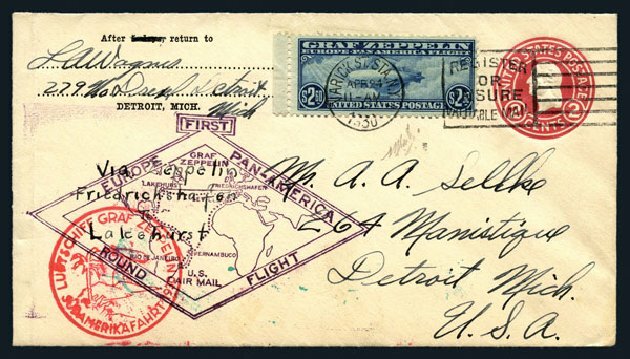 U.S.; Airpost, 1930, $2.60 Graf Zeppelin on South America Flight Cover, #C15, tied to 2¢ entire by Varick St. Sta. Apr 24, 1930 machine cancel, flight cachets in red and violet, Lakehurst May 31, 1930 cancel on reverse, Fine to Very Fine. Scott $625. Estimate $300-350. 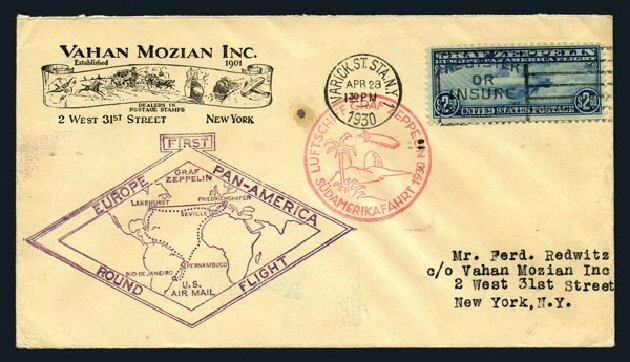 U.S.; Airpost, 1930, $2.60 Graf Zeppelin on South America Flight Cover, #C15, tied to 5¢ entire by Varick St. Sta. Apr 30, 1930 machine cancel, flight cachets in red and violet, Lakehurst May 31, 1930 and U.S.S. Arkansas June 2 cancels on reverse, Fine to Very Fine. Scott $625. Estimate value $300-350. 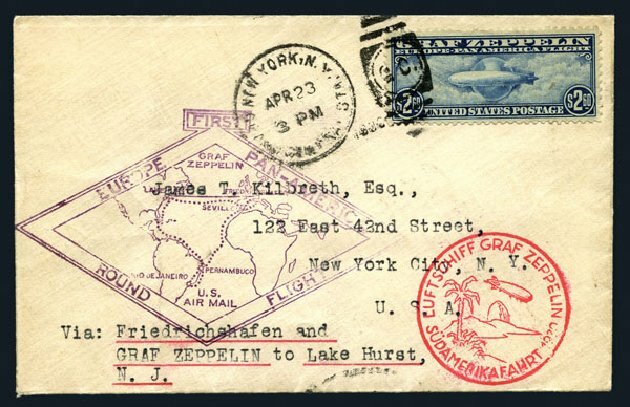 U.S.; Airpost, 1930, $2.60 Graf Zeppelin on South America Flight Cover, #C15, tied by New York Apr 23 duplex cancel, flight cachets in red and violet, Lakehurst May 31, 1930 cancel on reverse, Fine to Very Fine. Scott $625. Estimate value $300-350. 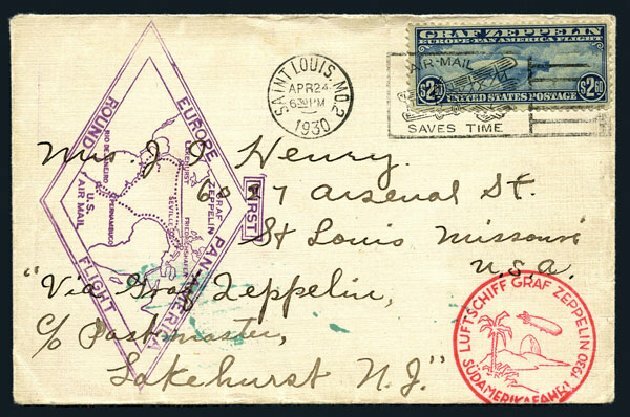 U.S.; Airpost, 1930, $2.60 Graf Zeppelin on South America Flight Cover, #C15, tied by Saint Louis Apr 24, 1930 machine cancel, flight cachets in red and violet, Lakehurst May 31, 1930 cancel on reverse, Fine to Very Fine. Scott $625. Estimate $300-350. U.S.; Airpost, 1930, $2.60 Graf Zeppelin, #C15, n.h., Fine to Very Fine. Scott $975. Estimate price $450-500. o U.S.; Airpost, 1930, $2.60 Graf Zeppelin, #C15, used, Very Fine, PF (2009) cert. Scott $600. Estimate $400-450. 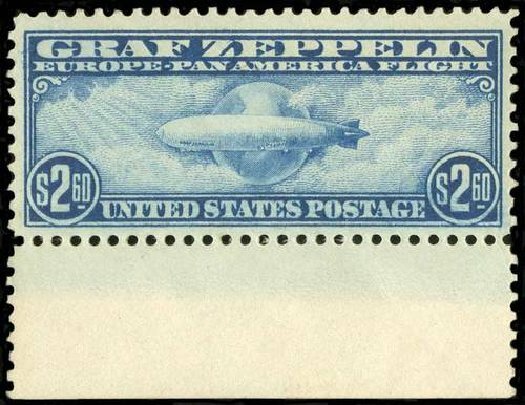 Airmail, 1930, $2.60 Graf Zeppelin (Scott C15), regummed over small faults, nice bright color, a good “looker”; reperforated at top and a tiny tear at right, otherwise Fine to Very Fine. Scott $575 for o.g. Estimate price $200 – 300. Airmail, 1930, $2.60 Graf Zeppelin (Scott C15), neat black slogan cancellation, sound and attractive example with ravishing rich color, Very Fine. Scott $600. Estimate $400 – 600. Scott #C15, $2.60 Graf Zeppelin, bottom sheet-margin mint single, bright and fresh, o.g., hinged in the selvage only, the stamp n.h., internal paper wrinkle at bottom right, otherwise very fine.